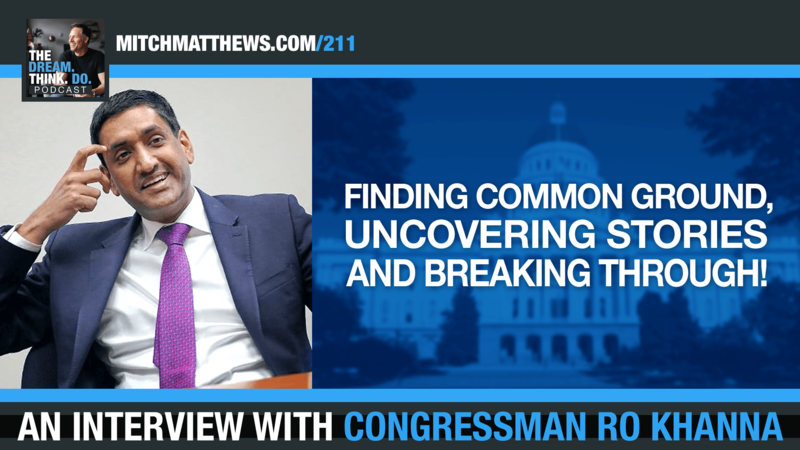 My guest is Congressman Ro Khanna, who represents California’s 17th Congressional District, which is located in the heart of Silicon Valley. The congressman is serving in his first term and currently sits on the House budget and the Armed Services committees. Now I know what you might be thinking dream think doers, you might be thinking wait, we don’t talk politics on Dream, Think, Do. That is true, but I didn’t invite the congressman on the podcast to talk about politics. Recently I met Ro at an event we were both at, and we realized we have a heart, we both have a heart for rural America. Ro is actually working hard on some really innovative strategies to bring high tech jobs to small towns instead of sending them kind of over places in the world. As you guys know, I come from a small town and I believe that some of the biggest and best ideas come from small towns. So we had a connection. Plus, I’m just fascinated with the guy. He’s got an incredible story. I’ll let you know here a bit more. Mitch: Now Representative Khanna was born in Philadelphia to a middle class family. His parents emigrated to the U.S. in the 70s from India in search of an opportunity and a better life for their family, for their kids. His father was a chemical engineer. His mother was a substitute teacher. Now this guy is no schlepp okay. He got his BA in economics from the University of Chicago, and received his law degree from Yale University. Not bad. From there Ro went on to such things as teaching economics at Stanford, as well as teaching law at Santa Clara University and American Jurisprudence at San Francisco State University. I could go on and on, but I’m just going to bullet point some things because we’ll come back to them. Mitch: But one, this is some of the cool stuff that he’s done that stands out to me. He provided pro bono legal counsel to Hurricane Katrina victims. He wrote a book called Entrepreneurial Nation, Why Manufacturing Is Still Key to America’s Future. He served in President Barrack Obama’s administration as Deputy Assistant Secretary to the U.S. Department of Commerce. Get this, this is staggering, this is horrifying, since he’s been in office he’s attended over 1,900 events. That number’s probably even gone up since I got this data, and he’s responded to over 70,000 personal correspondence. Sheesh! So, he’s getting stuff done. No matter where you land politically, that’s an impressive list, and he’s a good guy. I’m leaving a lot out, I could go longer, but after meeting Ro I wanted you guys to hear from him because I wanted to get in his head a little bit and hear about his journey and hear how he’s getting all this stuff done too. Mitch: Let’s get to this. Congressman Khanna, welcome to Dream, Think, Do. Ro Khanna: Thank you. I’m so excited about this. I love your podcast. It’s all about inspiration at a time I think we could use more of that, so thanks for having me on. It’s a real honor. Mitch: Absolutely. I love it. Okay so I just read off some of your accomplishments. I hope it made you blush a little bit. You can share it [crosstalk 00:03:06] and all that. Ro Khanna: They leave out all the failures. I’ve always wondered about the introduction. If someone could just do an introduction of all your failures at some point. Mitch: Exactly. You’re right. And then you’re just like ugh. Ro Khanna: They didn’t mention that I lost my first election 19% to 72%, or I lost my second time, or something. They conveniently omit all your failures. Mitch: Yeah, that’s a different Wikipedia page right. I love it. Well I appreciate you listing some of those off too. We’ll go after some of that just later too because I do think, I mean you’ve battled back from different things too and I love that. But okay so I see this list, I see you’re in the House of Representatives, you’re doing it, what were you like as a kid? I mean were you, I mean I see somebody like you it’s like all right were they the president of the student council, were they a wall flower. What were you like in school? Ro Khanna: No. I was a, I played Little League. I mean I wasn’t a great athlete ever. In fact, my full name is Rohit. It’s an Indian name. Growing up a lot of folks would call me Ro, but when I used to go up to bat people used to chant, “Ro can’t hit,” or [inaudible 00:04:22]. You never forget that stuff. Mitch: With a name like Mitch I totally get all of the rhyming strategies that can go along with that in elementary school, so yes. Ro Khanna: I was always, I was [inaudible 00:04:40], but I had a bunch of friends in my neighborhood. We use to play Little League. We used to play pick up basketball. I used to be a huge Eagles fan, Phillies fan growing up. I didn’t really get that interested in politics until I was in ninth grade. I remember there was an english teacher and she had an assignment that said you had to have something published. You’re in ninth grade you think how are you going to get something published. Ro Khanna: So I wrote a letter to the editor to the local paper, the Bucks County Courier Times. It was about the first Gulf War. They titled it Read This 14 Year Old’s Lips, George. It was the first President, George Herbert Walker Bush, who unfortunately just passed. As a 14 year old kid I thought wow the president of the United States is going to read what I wrote. Now I realize the president doesn’t even pay attention to members of Congress let alone someone, but I thought it was so exciting getting published. I think that was my first glimpse of an interest in politics. Mitch: Wow. It’s interesting the number of different types of people that I have interviewed, all different backgrounds, and authors, and Oscar winners and all of that, and it’s amazing how many times one high school teacher, like one particular assignment, or one little bit of encouragement from a high school teacher like started a new trajectory. I love that story. That’s amazing. Ro Khanna: It’s so true. I think the difference between some of us who’ve been fortunate to overcome failures and those who haven’t is just the support, love, encouragement from so many people. The people who tell you oh you’re going to do something if you keep going. I remember another high school teacher of mine, a 10th grade teacher, Mr. Wongo, who used to come in to high school and he would dress up as Teddy Roosevelt, or he’d dress up as FDR, and we’d have simulations about what it was like to be in politics back then. Those are things at the time you don’t realize how they’re shaping your interest, but they stick with you. Mitch: Right. That’s interesting. Absolutely. Isn’t it amazing, just again, one person being a little creative, a little out of the box. You don’t realize it, especially when you’re 16, because you’re trying to make the moves, you’re trying to make it happen, all that stuff, but you go oh my gosh, looking back you’re like that’s a part of this. What would you say as far as for you, obviously the bug maybe a bit you a little in ninth grade and maybe as you’re seeing Mr. Wongo do his thing, you’re like oh that’s interesting, when would you say it really started to hit you that going into politics, being a part of government, was a part of the dream for you? Ro Khanna: As part of the Independence Movement. While I was born in Philadelphia, I would visit at times and he would tell his story, and he was just sort of a legend. I always, I had this sense of the incredible possibility of politics and to do things that could change people’s lives, change the world in huge ways and the sacrifice. I didn’t think I would really go into elective politics. My first experience of that actually was in college doing it for someone else. There was a person who was running for the state Senate and I was a college kid, and I was knocking on doors for that person. He turned out he was Barrack Obama, who 12 years later would become president. Now young people ask me all the time how do you get to work for the president. I said it’s really simple, just when you’re in college figure out who’s going to be president 12 years later and go knock on doors for them. Mitch: It’s so simple. You should write a book on that right. Ro Khanna: But it does put it to perspective. I didn’t want to end up at University of Chicago. It was a bunch of chance things that took me there, I love my time there. But it shows you that these days you have so many kids that are obsessing over their GPA or where are they going to go to college, or school, and so much of that doesn’t matter. I mean it’s more probably consequential if you fall in love and you meet your wife there, or your husband, or partner somewhere, or if you end up getting some experience somewhere. For me, it’s almost the most, the things that have advanced opportunity have been things I haven’t planned. Mitch: Yeah. Well that’s one of the things … I get to do a lot of speaking on college campuses and one of the things I talk about is do your best in your classes, do your best in all the activities, but experiment as much as possible. Try those things that maybe don’t make a lot of sense, or things that you’re curious about, like go and do them. I’m guessing knocking door to door probably was like, some of it may be really connected with you, maybe some of it you’re like what am I wasting my time doing this, but it’s like to go and try some of those experiments, try some of those things out. You just never know where it might lead you, and college can really be that time where you could get in as many experiments as possible. Sometimes it’s about the experience, sometimes it’s about the people you meet. That is amazing that here you are 12 years prior to President Obama being elected or whatnot. But still, those networks, those relationships, they matter. It doesn’t always lead to presidency or working with the White House or any of those things, but they matter. That’s just a great example of it. Ro Khanna: I couldn’t agree with you more. It also shows you how remarkable in some ways this country is. There I remember in 1996 standing outside grocery stores where Barrack Obama is totally unknown, no one can pronounce his name, he’s handing out flyers, and 12 years later he’s running for president of the United States. I guarantee you he did not think he would be running for president of the United States back then. But it just, only in this country are some of those stories possible. It’s an amazing thing if you just put yourself out there with experiences of what the trajectory your life can take. Mitch: Right. Well and you just gave me a phrase that’s a perfect segue to put yourself out there. We’ve had entrepreneurs on, we’ve had writers on, we’ve had all sorts of different things, and any time you step out into a dream you have to put it out there. You have to take the risk that people might not like your product or your service. They may not like your book. They may not like your movie. They may not … You realize you have to take the risk that people may not like you. But I’m guessing that moving into and being a part of, running, being the candidate in a political campaign, I’m guessing that’s like a whole nother level of feeling like you’re having to put it out there, especially in today’s day and age no matter where you land politically it’s just this super charged time. Mitch: I do see, and I believe, and I think that the Dream, Think, Do movement is a part of that where we’re helping people find common ground and having conversations like this where it’s just finding out about people. It’s just a wild time to be, I don’t have to tell you, to be in government, to be in politics. What were some of the things when you were starting, say all right I feel passionate about this, obviously you were inspired by your grandfather’s story, by people that you’d worked with, helped, all of those things, but when for you, like what was your first campaign? Where did you first put it out there for you as the candidate? Ro Khanna: I was really passionate opposed to our war in Iraq in 2003. I ran a campaign against an incumbent member of Congress who had supported the war. As I mentioned earlier, I lost 72% I think was what the incumbent got, I got 19%, and there was a third candidate who got 8%. Let me tell you very quickly here, it’s humbling. I mean all the fancy degrees, all that doesn’t matter when 70% reject you. The thing in politics is success is being rejected by 45% of people. That means you get 55% of the vote. Imagine 70% rejecting you. But, and this is I think one of the things that folks don’t talk enough about who have had the opportunity to pursue dreams, is I had lots of moments of self-doubt, of oh is this something that I’m really cut out for. I only got 19% of the vote. Then years later, it took me 10 years to run a second time. I did a lot of other things. But in my second campaign I lost a close race, 52-48, and people had said oh you’re a two time loser you can’t run a third time. Third time, people don’t vote for folks after they’ve lost twice. Ro Khanna: I think most people, I mean there may be some people who just have utter confidence and keep going, but for me there were moments of real doubt. What got me through that were close friends, my wife, my parents, family who at times believed in me more than I even believed in myself, and kept saying no you’ve got to keep going after what you want. Mitch: But how did you, what were some of the things that you had to do to say all right I am going to do it a third time? Because I know a lot of Dream, Think, Doers are leaning in on this one because they may not be thinking about running for a governmental office, but you know behind every huge success are, as you alluded to earlier, a lot of failures. Some of the secret sauce of truly making dreams happen is that getting yourself back up and doing it again. What did you have to do inside to really push and say all right I’m going after it, and I’m going to go after it all in, not kind of holding back, but all in? Ro Khanna: Well I’ll tell you that, but my wife when we were announcing on our third time gave the best speech. She said it took Ro three times to win me over. First time he was rejected, second time I broke up with him, third time he got it. Mitch: I like her. I like her. Ro Khanna: She gave the best speech of that whole campaign. But for me it was a self-reflection on what I could have done better. There’s a tendency to say oh I lost because my opponent was unfair, or the voters didn’t get what I was saying. There’s probably always truth to finding what other people did wrong or obstacles, but for me I really thought what did I do wrong and what could I have done better. One of the things I realized was I was focused, for example the second campaign I had all this media and people were writing profiles and articles, and I realized that actually didn’t matter nearly as much as having coffees with 10 people out of the spotlight and just going and having tons of meet and greets with people around the community, and that national press mattered a lot less than sort of local press in a local town, and that even though I had this background of understanding technology in Silicon Valley in my district there were a lot of people who didn’t have those opportunities and who were being left out of that. It made me actually a much more empathetic person genuinely and aware of the community that had been left out. Ro Khanna: I’ll tell her. She was a big asset too. We were not engaged at the first campaign. We were just dating. Then we were married by the second campaign. I think that probably made a difference too, just her being out there. Mitch: Heck yeah. That’s awesome. I love it. I want to shift gears a little bit because I listed off … I know your website I always appreciate. My website has number of people trained and number of cups of coffee drank last year, all of that stuff, so I love that, but listing off the number of events you’ve attended I can only imagine, the correspondence. I know you’re traveling all the time, splitting your time between coasts, in D.C., being in California, all of that, but you still get a lot done. I love, especially when I talk with super achievers like you, getting in your head a little bit around that. What are some of your strategies for allowing, to get stuff done, to stay focused and to get stuff done? What would you say are a couple things you lean on? Ro Khanna: One of the things I genuinely believe, and it’s true about a lot of folks I think in politics regardless of your ideology who manage to have some success, some may be good looking, some are not, some might be smart, some are not, some may be creative, some are not, but the one thing most of them have in common is they work really really hard. Actually, people will tell you that about both Donald Trump and Hillary Clinton. As polarizing as that election was, no one would tell you that either of them aren’t working hard. When you are … I tell my staff always and my team, I said what matters most is we’ve been elected to do something, people are working hard, we’ve got to just outwork everyone and make sure people know we’re working for them. It’s just a discipline that I have had. I don’t know what, it’s just I’m passionate about things. If I’m not spending time with my family, I’m working. I love the work so it doesn’t feel like work. It’s not setting a schedule as much as just I get excited about the things that I’m doing, and that motivates me to work. Ro Khanna: What I have to get better at is at times I was sort of on my phone, as I’m sure everybody is, sending texts or emails while I’m in conversation. Then my father-in-law actually, we were having a conversation, he said when you’re on your phone that’s disrespectful. It’s showing that the time with the person next to you isn’t as valuable as your phone time. It really actually struck with me, and so now I try to be very present. I’m either all in working, or I put my phone down and I’m with friends, family. That sense of just being able to leave your phone, leave your work and concentrate in the moment with people and not be on text or email is something that I’ve gotten better at. Mitch: But that is, especially in today’s day and age, I mean that’s healthy people’s crack. Mitch: Literally, I mean you look at the data how addictive that is, but also when you do stuff you love and you’ve got a lot of stuff going on it is so addictive, it’s so hard, so you really do have to be very intentional. This is not just blowing smoke or whatever, but true encouragement to you is that one of the things that stood out to me when we were at the event together was that I got to see, we got to interact, but there was press there, but there was lots of people from the area. We were in Jefferson Isle, what’s up Jefferson. Everybody, each time I would look over and saw you interacting, whether it was a reporter, but also anybody local, or not a well-known person but somebody just from the town, you, I could see you were just fully present with them. To me, that’s one of the best compliments you could give somebody is to be fully present in the moment with them, especially at an event like that when there’s a thousand different things going on. I just, that was one of the things that really stood out to me that said this is a guy I want to get to know better. If you’re doing that with I know a thousand different things tugging at you, that means a lot. Ro Khanna: I appreciate that. That is one of the highest compliments I think I could receive, and I appreciate you saying that. But it’s how I was raised. I mean I guess I grew up on a block where everyone mattered and everyone had their story, and everyone had something they were great at or could contribute. I feel that about Jefferson. I mean I was, I actually wanted to tug on the people there more than the reporters because they’d done something extraordinary. This was a 4,200 person town that has managed to figure out how to create 25 jobs for people doing high tech and can stay in Jefferson and work anywhere in the country. Ro Khanna: I guess I really believe, not in a syrupy way, but I believe that what makes America exceptional is we believe in the extraordinariness of every person. I mean China, they don’t have that model. They have this elite model, you’re either in government or you’re in one of these state enterprises. If you’re just an ordinary person, it’s a rounding error, or you’re dispensable. That’s just the reality. Whereas in our country we really believe it’s the small towns, it’s the regular folks who are propelling us forward, frankly despite all of the mistakes we’re making in Congress. Congress isn’t working, but the country seems to be doing fine because all of, or at least moving forward, because of people. To me, getting to know folks is getting to know what makes us exceptional. Mitch: I couldn’t agree more. I think especially even in navigating events like that. I’m actually an introvert who’s learned to be extroverted, or at least at events like that I can be extroverted, but I’m an introvert. One of the things that I’ve found is actually being curious, like I really want to find out about people that I’m interacting with. That actually helps to soothe that inner introvert, but also try to honor that person in front of me. I think that is huge, but I couldn’t agree more with you as far as, again, what Jefferson is doing is just amazing and incredible example of the ingenuity and heart that I think is happening in rural, but all across the country. Again, that position that it’s right, we’re moving forward. We’re a country that works hard, and that’s why we are who we are. Especially the more that we can work together, the better. I love that. Mitch: Well I just, I love your story. I appreciate big time your candidness also, but the wisdom you’re sharing too. I want to really respect your time because I know you’ve got to get back to it, but I always love to ask for one last pearl of wisdom. We call it our wisdom of the week. What’s a piece of advice that somebody’s given you that helped you either stay focused, or to help you on that front to keep going? Ro Khanna: Well you know there’s a quote that I love, and I don’t remember when I read it, by Mark Twain. It’s that “the two most important days of your life are the day you were born and the day you figure out why.” For me, when I got that sense, when I had lost a couple races and other things and I reflected on that, I said no the why for me is I really want to have an impact on public affairs and the life of this country, that’s what I want to do. Whether I do that from the United States Congress, whether I do that for the city council, whether I do that working for somebody, whether I do that writing, that’s the why for me. Ro Khanna: I guess that really propelled me to be, it doesn’t matter win, loss, whichever way it’s going, as long as I’m doing the work I love I sort of know that that’s what makes me tick. I guess it may be cliché, but I think so many times we’re worried about all of the external issues and how to get all the logistics, and all that matters, the practical stuff matters, but we probably should spend more time on the why because that really becomes obvious. It becomes obvious most also when you have setbacks because if you have the why you’re going to be more resilient and willing to overcome the setbacks. Mitch: I love that. I love that quote, but I also love the application of it too. It’s so, so true. Well Ro, thanks so much for taking the time to connect today, but also for your sharing your story and for doing what you do. I really appreciate it. I look forward to having you back on. Ro Khanna: Well thank you. Thanks for what you’re doing in terms of bridging conversations and inspiring folks. Frankly, we could use a lot more of that at this time in our country, so I really appreciate the work you’re doing. Mitch: Absolutely. All right, well keep bringing the awesome Ro.